A number of you have been asking about subscribing to my blog, so that you know when I update it. Well being "blonde" and a "tech tard" (as JulieHRR has deemed herself and I do believe I qualify for this category as well - LOL) I have tried to update the "feedburner" on my blog so that you can subscribe to my blog and be notified of any new additions. What you may ask is a feedburner? Well I don't really know (insert big, silly grin and shrugged shoulders), but supposedly it will inform you of any new posts. If this is true woohoo for me - if it's not please let me know otherwise, and I can then insert the little smilie that grins with pink, embarrased cheeks. LOL. So scroll down on the right side of my blog and you will come to the "Subscribe to this blog's feed" link. Follow the link and do as they suggest and hopefully you're set. If anyone reading this goofy post knows what I'm talking about please step in and inform me and the rest of my readers what it is precisely that I'm doing here. LOL. I love your patience with me ladies, this is indeed a true learning experience for me. I do hope this little "feature" comes in handy for those who would like to follow my posts. I needed to rejuvenate myself last night and just stamp, to stamp. 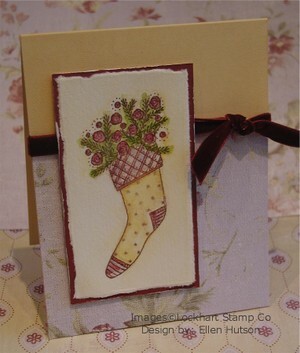 This paper and stamp have been calling my name ever since I laid eyes on the lovely Lockhart Christmas Rose Stocking and this gorgeous Wild Asparagus paper. Many times the color scheme I select for my cards is brought about by the mood I want to convey. Other times, like in this case, it comes totally from a background paper I would like to incorporate. This is a color scheme I would have probably not come up with on my own just because it is so unusual - it is a split complimentary scheme (some day soon I hope to get to writing more about color - this will just have to do for now though Ü). It is slightly "deviated" though being that the primary color is saffron instead of green. Black has been added to each hue to muddy down the colors and make a "shade" of that color - I LOVE the soft, shabby feel of these colors produce. Being that I typically don't do shabby this was fun. 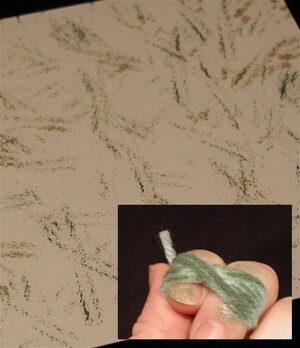 once softened tear it and flatten it between your fingers. If you need pictures just post to this thread and I'll see what I can do about it at some point. Trying to keep up with all the things that are in my head is almost an impossibility - LOL! In trying to get a handle on how to keep this blog organized I came across the category settings. I'm going to try and give this a whirl and hope that it will help you "find" things again here on my blog after it gets archived. I realize that I am pretty long-winded and so there is a LOT of scrolling happening. As I become familiar with the features that Typepad has to offer I hope to keep this little place better organized. So please hang in there with me as I struggle through figuring these things out. I have also not forgotten about all those who are checking in to learn about the Elements and Principles of Design. On top of everything else I have going on I have injured my left wrist and so typing is even not something that happens easily. Egads - why does life stuff just happen all the time??? For someone who likes to keep life organized in neat little packages I have certainly had to learn to just let go and do what I can instead of having everything meticulously lined up and perfected (insert painful grin). Do not fear though - hopefully sooner rather than later I can get the ball on a roll here and do everything that is in my dreams. I'm just sitting here laughing right now at the name of my blog - simple dreams --- the dreams are simple, it is just the working towards those dreams that gets a little hairy at times. Thanks for hanging in here with me and I thank all of you for your words of support, encouragement and praise. THANK YOU! 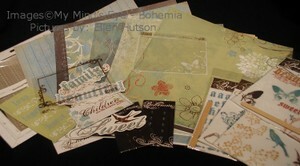 One of my favorite things to do is to sit down and create samples for upcoming classes. 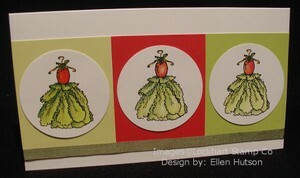 These are headed to Smudges in Minnesota to put on display for one of the classes I will be teaching on color pencil techniques using the Lockhart Vegetable Couture stamps. When I did my little knitting background "experiment" I fell in love with the layout I came up with and decided I just HAD to use it again for this funkay dress. Cutting out the greens and bending them adds SO much dimension to this little dress. If you would like more information about this upcoming class just click on the class link to the left. Well I'm off to create some more goodies. I've been working on these pictures for some time now. As with everything this was a project I started a while back to share some of my storage solutions with you here in cyberspace. I hope that in the midst of everyday chaos you have a happy place too. I still need to take the big picture - but being that it is a disaster right now I think I'll wait until I get it picked up just a little. With all the projects I have going on right now and more deadlines over the next two days it's just going to have to remain organized chaos. Hopefully then I'll get it back to it's original state and I'll feel comfortable sharing my little stamping haven with you all. Until then I hope that you can enjoy "My Happy Place" by clicking on the album to the left. I tried to include a little explanation with each picture to let you know why I find these tools helpful. It is always so thrilling to get the box at my front door that is from Primedia. It is with much anticipation that I open it to find where in the magazine they have put the projects I've created, how they photographed them, what they've said... Yesterday was one of those days. I am so excited to share that on pages 20 and 21 of the October Issue you will find my little creations. I wish I could share a sneak peak, but I believe that my agreement with them doesn't allow me to at this point. So if you subscribe to Paper Crafts check it out - it was so much fun to design. It all started with the witch shoe. I had created this elegant shoe template and wanted to use it in a fun way for Halloween. 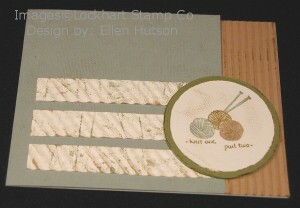 It was on this "journey" that I discovered Lockhart Stamp Company. When I went out to find a shoe stamp that had an elegant feel to it I found the Lockhart Party Shoe. 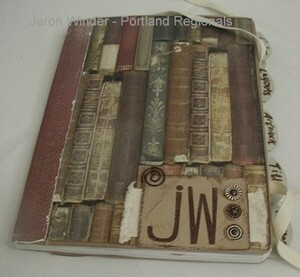 I have fallen in love with it's versatility (and the other numerous fun stamps in the Lockhart line.) What really appeals to me about this shoe is the variety of ways you can change this shoe by doodling on it. To see what I'm referring to check this link out. Thanks for sharing in my excitement with me! Now I'm off to can tomatoes. Yes - some of my friends refer to me as a "Martha" wanna-be. Well I don't really want to be Martha, but I certainly enjoy doing a LOT of the same things that she does. Then I need to wrap up the designs that must go out in tomorrow's mail, and complete the samples that will be going to the stores for the classes I'll be teaching. I'll be certain to photograph the class samples and give you a sneak peek and try and talk about some of the design elements and principles that I followed in creating them. Thanks for stopping by and I hope you have a MARVELOUS day! Publishing calls that need to be adapted and gotten in the mail. Class samples for all the stores I am teaching in this fall - completed and gotten in the mail. Publishing calls that need to have projects designed. Website - that pesky little detail - LOL. Orders that have arrived and need to be unpacked, put in place and then sent out. Articles - samples, articles - samples (so please know they will be coming and don't give up on me). I fully believe in the whole design process and I am SOOO excited to share it with you! So thank you again for your patience and support. 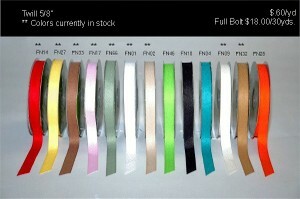 Here is a little eye-candy that arrived today Ü More beautiful colors of twill. 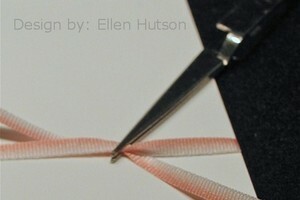 Check back to the how to print on twill directions here. I even ordered some 1 1/2" and hope to post some samples to share with you soon - it's simply cool stuff!!!! There is nothing like unpacking a box of ribbon!!! 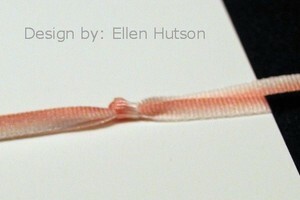 I'll have to post some pictures of the silk ribbon that arrived as well - it is so incredibly soft and beautiful! Oh for more hours in the day! (and night - LOL). it heightens our perception and intensifies our emotions and psychological reactions. To become proficient with color, you must spend time studying it and working with it. There have been numerous color “systems” developed in an attempt to put order to color; to try and make it easier to understand. Some are simple and others are technical. I’ll try to keep it simple, yet bring you in to why I find it so very fascinating. After studying color I realized that I would never take my eyes for granted again – they are amazingly complex… way too complex for me to even begin to understand. Hopefully this information will help you begin to understand how we perceive color and therefore give you a basis on which to build your knowledge. It is the color system of white light that mystifies me, yet intrigues me. It is important for artists and designers to pay attention to the “source” of light in which they work. Different light sources (natural-sun, incandescent, fluorescent, halogen) will change the color perception. What is most amazing to me is that the color our brain perceives is not tangible, it’s not real. Light information is carried to our brain through the optic nerve via wavelengths – so what we see is not actually color, but vibrating wavelengths that are emitted from the surface of every object. Each color “hue” has its own wavelength. These wavelengths also determine a color’s intensity. The intensity of a color will change dependent on the amount and type of available light. This is why many have such a difficult time picking colors for painting walls – what is perceived as “the color” on a north wall will be different from what is perceived on a south wall. This is because the light source varies in type and amount. Color selected under halogen light will be perceived differently under incandescent light or natural light. So, is it important to truly comprehend and understand this perception of color? Most likely only if you want to pursue a career in the visual arts – LOL. BUT, knowing a little of what is behind these theories will help make it easier for you to make decisions when it comes to selecting and understanding color combinations. The point of this dialogue is… if you want to have consistency when you “see” color be certain to use good light, consistent light. This will allow you the freedom to look at your colors with the “same eye” each and every time. I would also like to thank those of you who have taken the time to let me know that you are excited about this, that you are looking forward to what it is that I will try and share. I hope I can keep up with you all and I thank each of you for sharing in my excitement. THE MANY MOODS OF COLOR! Color psychology – it sounds so profound. How does color make us feel? Did you know that the color wheel was developed more from the perception of humans and their psychological reaction to color than any scientific theory? I’ll explain the whole color wheel concept at some point, but it is the “moods” of color that I find compelling. Color evokes feelings, it represents ideas, and so, if you learn to choose appropriate colors for the feelings you are trying to convey it will bring your work to a new level. Knowing the association will inform your color choices. PURPLE – is the color of royalty, spirituality, bravery and sophistication. It can feel mysterious and even threatening when mixed with black. When mixed with white it is romantic, nostalgic and dainty. BLUE – communicates trust, confidence, serenity, and reliability. It can also convey a feeling of loneliness or sadness. 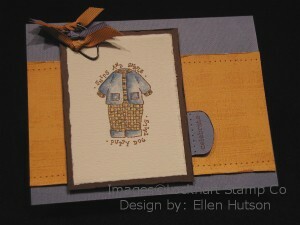 The lighter shades of blue are lighthearted and positive. Blue is the most favored hue. GREEN – for some is a kind, generous color, which represents loyalty and intelligence. It symbolizes fertility, growth, life and healing. Yet for others it invokes feelings of envy and greed. YELLOW – brings about a feeling of optimism and happiness. It is a cheerful, energetic color that can stimulate your imagination. ORANGE– is vibrant, exotic, and flamboyant – it gets your attention! It cheers and it stimulates appetite and conversation. RED – is HOT! Passionate, festive, exuberant, romantic are all words used alongside the color red. Other feelings brought out by the color red are danger, aggression and excitement. Pink is a feminine, tender, affectionate form of this color. WHITE – brings life to other colors. It is clean, pure, youthful, simple and innocent. BLACK – can be sophisticated and mysterious. It can also show authority and discipline. GRAY - is a lifeless color. It depicts practicality and sadness. BROWN – represents stability, simplicity and comfort. It is a conservative color. When you become stumped with a project that you are working on – not knowing what colors to even start with think about the feeling or “mood” you want your work to portray. Think about each hue and what it means to you. Your definition for each of the colors above may be entirely different then mine. I challenge you to take out a piece of paper right now and list all of the colors above and then write down what feelings these colors bring forth in you. Then when you go to create a project think about what feeling you would like to represent. 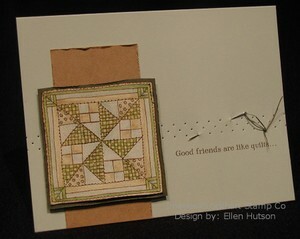 Are you sending an exuberant, happy birthday card, or do you need to convey your heartfelt sympathy to a special friend? Do you want to invite guests to a sophisticated black tie affair or a jumpin’ kid’s party? When I actually take the time to think about the feelings that I want a card to portray my cards improve dramatically. For example when I created this slipper card – brown was used to convey comfort, soft yellow to show happiness and optimism and soft blue trust and confidence. The colors go hand in hand with the sentiment. Pink – totally feminine - Hmmm – to you think it’s for a girl – LOL! But the green adds in a feeling of life – newborn life. 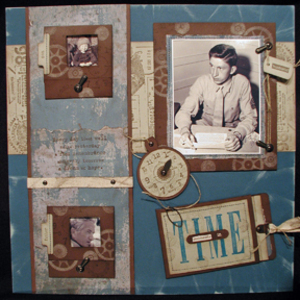 This scrapbook page has a story behind it – to me it is a meaningful, sentimental story. This page was created in honor of my father-in-law. Many of you have seen this page, but I have never explained the choices behind my selections. I might use it again for other parts of the “lessons” I’ll be sharing just because I did put a lot of “emotional” thought behind this creation. When I sit down to create a page, a card, a project I don’t get all “theory” oriented, but I do think about what it is that I want to reveal. Being that I wanted to see the “soul” in these pictures I removed all the color from the photos – I wanted to draw the eye in to the faces in each segment. I then picked two colors – Not Quite Navy and Brown. The blue symbolized trust and confidence, but more so, it denoted the sadness I was feeling at that time. Losing two fathers in less than a year truly does something to ones spirit - it was a difficult emotion for me to accept. The brown brings forth the sense of comfort that creating this type of piece brought to me. By thinking about my father-in-law and putting my feelings on paper it brought a sense of healing to my heart. 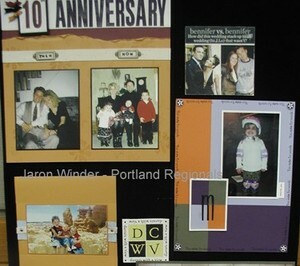 The loss of my own father is still too fresh – I can’t quite bring myself to do something like this yet. But I do know that when I am ready I will allow myself to express my feelings, my moods, and I will use color to portray what it is that I am thinking. 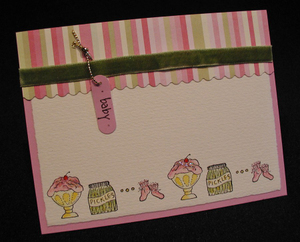 As you design your cards, your scrapbook pages, and your paper craft projects, think about the feelings you want to evoke and perhaps selecting colors will become an easy part of the process. You won’t need to look at what someone else did – all you will need to do is think “what feeling do I want my card to bring out in the person I am sending it too?” and the decision will become apparent. Explore your many moods of color!!! The teacher in me wants to share everything I know, but the realist knows that it will take me hours to do so. Therefore I'm going to try and do this in a series perhaps, or get as much out as I can in as short a statement as possible. Thus I'd better quit jabbering and get down to it. Tonight I'm going to try and list the Elements and Principles and then I'll work my way through them as I find the time. Design - it's an arrangement or a way of organizing things. The elements of design are what our eyes see and then our brain decodes. These elements effect our senses - they are what we organize in design. The Elements of Design are the building blocks of your artistic creations. hue - represents a specific color or light wavelength in the color spectrum. Red, yellow, green, blue and back to red again. intensity - brightness or dullness of a color. 2-Line - boundaries or connections in your layouts. Line has many variables - size, shape, direction, position, number, and density. 3-Space - the area between and around objects on a layout. Positive AND negative space. 5-Form - 3-d shape. Create an illusion of form in your artwork. 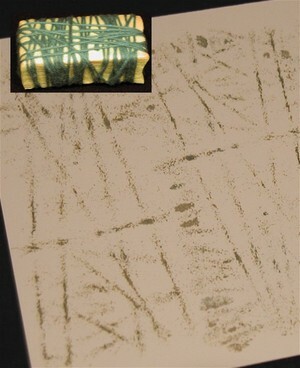 6-Texture - surface characteristics that you can see (visual) and feel (tactile); rough, smooth, glossy -etc. 7-Value - again the lightness or darkness of color. Artists devote years of study to this one element which creates 3-dimensions to your 2-dimensional art. The principles of design are the tools by which you can arrange the elements of design in your layouts. It is the organization of a work of art. 1-Formal and Informal Balance - it's a physical symmetry. When the elements of design are brought together to create a sense of unity it will be more visually pleasing. 2-Emphasis/Variety - dominance - giving an object more importance than any other part of a layout creates a focal point or emphasis - a point on which to rest your eye. Variety keeps it interesting. Variety or contrast can be created by the juxtaposition of opposite elements (i.e. line - straight/curved; color-red/green) in close proximity of one another. 3-Rhythm & Movement- repetition of elements of design to create agreement. Repetition can be one element of design repeated at consistent intervals. Gradation - progression of size, color, direction - causes your eye to move around a layout. 4-Proportion - the relation of one part to another in a layout. 5-Harmony/Unity - when all objects in your layout give you a sense of oneness or the work is presented as a whole, not in separate little sections it has Unity. Harmony in music results in a pleasing tone to the ears; harmony in art results in a pleasing work to the eye. WOW - that took me a LOT longer than I remember it taking me in the midst of my studies. I even had to drag out some of my old notes - LOL! The good news is that I will try and break down each one of these over the next while. Please let me know if you find this helpful, so that I will continue on this merry pursuit. If I don't hear anything I'll know that it's pretty boring stuff to most of you and that I'm an oddity for certain (insert big grin). OK- I'm off to get some shuteye. Talk to you all tomorrow. This card is LONG overdue and once again it was the SCS color challenge that allowed me to make this card so quickly. I should have taken the time to make the Fabriano paper background a little smaller - I don't like it when I don't have the scale right. Too much white and too much "marigold" - in a perfect world I'd pull it apart and do it over, but being it has taken me this long to get to this little project I'd better just leave it and run! Sometimes working quickly just doesn't give me the total WOW I'm looking for... but I loved how these colors worked with this image. I must add that I LOVE the flannel background that I just purchased from SU. I think I'll be using that one a lot! At last - I'm finally getting my fall schedule posted. It still isn't completed, but I'm working on it. I hope to add a few photos to give you a snippet of what I will be sharing in class. Just enough to entice you, yet keep the surprise element Ü The link to the classes I will be teaching in September, October and November can be found here. Please contact the store that interests you for further information and to sign up for the class of your choice. I'm thrilled to be heading to the Twin Cities on September 20th and teaching at an awesome store, Smudges. 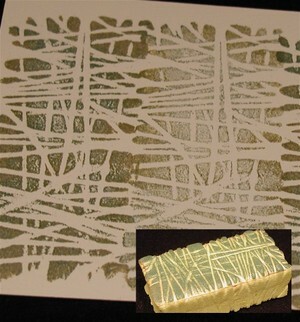 I will also be keeping myself impossibly busy here in the Seattle metropolitan area teaching at Make an Impression, Rubber Soul (Redmond location), Monkey Love Rubber Stamps and Art N' Soul. I would love to have you join me at any of these locations and I will do my best to make certain that you walk away from each class tickled with what you have learned! I adore the papers, transparencies, rub-ons... well I guess you could say I love this manufacturer! Being that I had a 30 minute time span between appointments yesterday I just HAD to stop at our local scrap store "Mad Scrapper". They were just unpacking the new goodies from CHA - I do believe that I died and went to heaven there for a few minutes. I'm working on two very special projects and these are the goodies I selected to add to what I already have at home! 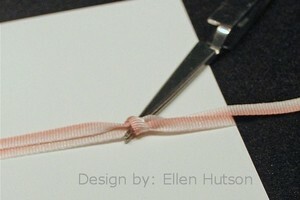 The second grouping is totally different from the first - I LOVE to stretch my mind and creativity. Wouldn't you know it though when I turned the paper over who do you think manufactures it? 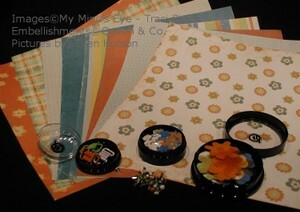 Yep - My Mind's Eye - designer Traci SIms. When I saw these papers and colors I just couldn't step away from these! They glommed on to my brain and therefore my hands just had to pick them up - LOL. Then I found these awesome Queen & Co. goodies to coordinate - LOVE, LOVE, LOVE this grouping too! Now I just need to get BUSY!!! It would be so delightful if I could just clone myself and go without sleep too! Oh well - that's not going to happen and so patience must insue! Hopefully I'll create something spectacular with these - but how could you not with goodies this sweet!!! are like quilts... they age with you, yet never lose their warmth." I love this quote! I've been struggling with these Lockhart Stamp Company quilts - trying to figure out something I could do with them that made me think, "WOW, I like that!" As typical this idea came to me while I was driving in the car. 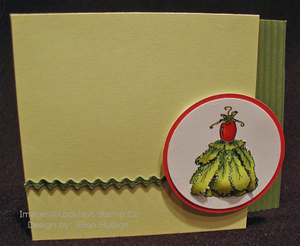 Why not add some "linen" texture to the cardstock first, then stamp the quilt, maybe doodle just a little to make the details finer and poke some holes to make it look sewn. I also remembered that someone had said that Spencer had threaded a needle with a little "bitsy" piece of paper at this year's SU convention. 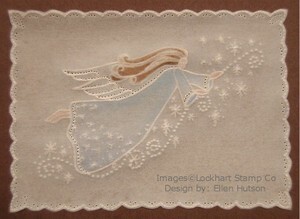 I wasn't there and I haven't seen a picture but I figured "I can do that" and sure enough I do believe this is just the perfect little embellishment for these quilts. So tonight when I allowed myself the pleasure to stamp I went for it. I used the color challenge from SCS to color in the details and add the accents. The quote I found at my favorite quote site The Quote Garden. They have some others that I jotted down too - because I'm convinced that I REALLY like these quilts now. Hopefully this has inspired someone to go and dig up a good saying and create a card!